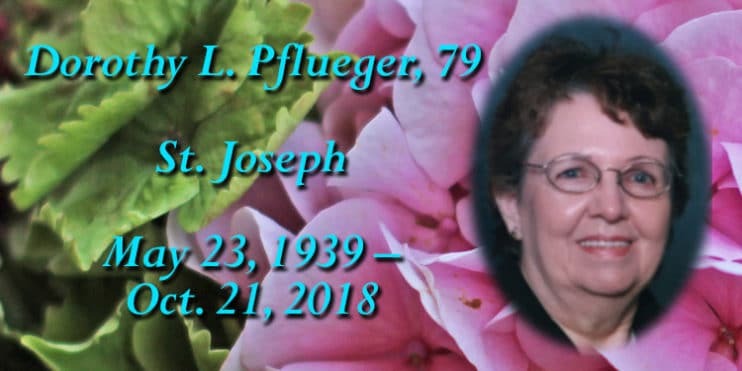 Dorothy L. (O’Brien) Pflueger, 79, of St. Joseph died peacefully Oct. 21, 2018 at the Mother of Mercy Nursing Home in Albany. Her funeral will be held at 10:30 a.m. Thursday, Oct. 25 at St. Joseph’s Catholic Church, 12 W. Minnesota St., St. Joseph. Burial will take place in the Minnesota State Veterans’ Cemetery in Little Falls. Visitation will be held from 4-7 p.m. Wednesday and after 9:30 a.m. Thursday, BOTH at the Heritage Hall at St. Joseph’s Catholic Church in St. Joseph. Parish Prayers will be held at 4 p.m. Wednesday at Heritage Hall. Survivors include her children: Ken of Avon, Steve of St. Joseph, Kathy (Byron) Cigelske of Avon and Brad of Albany; nine grandchildren; two step-grandchildren; nine great-grandchildren; and brothers Harold and Robert O’Brien and sister Mary Blanchard.